Jefferson recently had ankle surgery and is expected to require 4-to-6 weeks for recovery, Jamison Hensley of ESPN.com reports. Jefferson recorded 74 tackles (53 solo), six passes defensed, one interception, one sack and a forced fumble across 14 games in the 2018 season. Analysis: Jefferson put together another solid campaign in 2018, anchoring one of the better secondaries in the league alongside Eric Weddle. However, Jefferson is slated to have the fourth-highest salary on the team next season, and with plenty of Ravens defensive starters entering the market this offseason, the safety could be the target of contract restructuring. Jefferson (ankle) is active for Sunday's Week 15 tilt against the Buccaneers. Analysis: The standout safety has missed the last two games with his ankle issue, but he'll suit up Sunday against the Buccaneers' high-powered passing attack. Despite sitting in the last pair of contests, Jefferson has logged 61 tackles (41 solo), one interception, one sack, one forced fumble and one fumble recovery this season across 11 games. Jefferson (ankle) is questionable for Sunday's game against the Buccaneers. Analysis: Jefferson was a limited practice participant Thursday and Friday and appears on track to return Sunday against Tampa Bay. The 26-year-old has 61 total tackles, a sack, forced fumble and an interception this season, but he's been held out the last two games. Jefferson (ankle) did not practice Wednesday. Analysis: Jefferson was withheld from last week's tilt with Kansas City, so there's a shadow of concern above Baltimore this week. If the veteran can't practice before Sunday, perhaps the Ravens will have to turn to Chuck Clark once again. Jefferson (ankle) is inactive for Sunday's Week 14 contest against the Chiefs, Jamison Hensley of ESPN.com reports. Analysis: Jefferson was held out of practice all week and is considered doubtful entering Sunday. Chuck Clark will likely draw the start with Jefferson sidelined. Jefferson (ankle) is listed as doubtful for Sunday's matchup with the Chiefs. Analysis: Jefferson was unable to practice in any capacity this week. 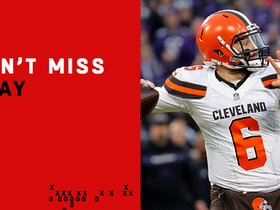 The Oklahoma product missed his first game of the season last week, and it seems likely that he'll miss the Week 14 contest as well. If Jefferson doesn't play Sunday, Chuck Clark would likely draw the start against the Chiefs. Analysis: Jefferson sat out last week's win over the Falcons, and continues to manage his recovery from an ankle injury sustained Nov. 25. As long as Jefferson remains sidelined, Chuck Clark will draw the start at strong safety. Jefferson (ankle) is ruled out for Sunday's game against the Falcons. Analysis: Jefferson sustained an ankle injury during a Week 12 win over the Raiders and will sit out Sunday's tilt against the Falcons as he continues to manage his recovery. Chuck Clark will draw the start at strong safety as long as Jefferson remains sidelined. Analysis: Jefferson is nursing an ankle injury suffered during Baltimore's win over the Raiders in Week 12. It's probable that Jefferson will need to fully return to practice before retaking the field, so his participation in practice Thursday and Friday will be worth monitoring. If Jefferson is unable to suit up against the Falcons on Sunday, Chuck Clark will likely draw the start at strong safety. Coach John Harbaugh is uncertain if Jefferson (ankle) will be ready to play Sunday against the Falcons, Jeff Zrebiec of The Athletic reports. Analysis: Jefferson exited the first half of the Ravens' Week 12 win over the Raiders with the ankle injury and didn't return. The Ravens appear to be viewed Jefferson as a day-to-day for the time being, but concern about his status for the upcoming weekend would increase if he's unable to practice Wednesday through Friday. Chuck Clark would likely act as the primary option at strong safety versus Atlanta if Jefferson is unable to go. Jefferson is ruled out for Sunday's game against the Raiders due to an ankle injury, Jeff Zrebiec of The Athletic reports. Analysis: Jefferson will not retake the field due to an ankle injury sustained in the first half. Anthony Levine will enter the starting lineup for the remainder of Sunday's tilt against the Raiders and as long as Jefferson ultimately remains sidelined. Jefferson (thigh) will play in Sunday's game versus the Bengals. Analysis: Jefferson has been nursing this thigh injury throughout November but hasn't missed a game. The sixth-year pro has 54 tackles, one sack and three pass breakups in nine games, so his IDP value isn't flashy. Jefferson (thigh) is officially listed as questionable for Sunday's game against the Bengals. Analysis: Jefferson was unable to get fully healthy during Baltimore's bye, and his Week 11 status appears uncertain. It's possible that Jefferson could be a game-time decision for Sunday's tilt against the Bengals. If the starting safety is unable to suit up, expect Anthony Levine to slot into the starting lineup. Jefferson (thigh) was a limited particpant in Thursday's practice, Jamison Hensley of ESPN.com reports. Analysis: Jefferson did not practice to begin the week, so his limited participation is a step in the right direction. 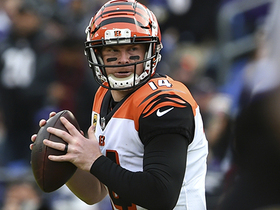 The 26-year-old appears to be nursing a thigh injury suffered during Baltimore's bye week, and it remains to be seen whether he will suit up for Sunday's tilt against the Bengals. With Anthony Levine (ankle) also managing an injury, Baltimore may struggle with depth at the strong safety position Week 11. Jefferson (thigh) did not practice Wednesday, Jamison Hensley of ESPN.com reports. Analysis: Jefferson did not enter Baltimore's bye week with a thigh issue, so the exact nature of his injury is unclear. 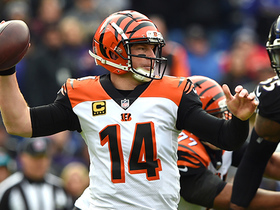 The 26-year-old's availability for Sunday's tilt against the Bengals appears to be in question, so his participation in practice is worth monitoring as the week continues. If Jefferson were to remain sidelined for any amount of time, Anthony Levine would slot into the starting lineup. Jefferson (hamstring) is active for Sunday's game versus the Steelers, Jamison Hensley of ESPN.com reports. Analysis: Jefferson has only missed one game in his six-year career, and he avoided his second. The 26-year-old safety has 49 tackles, three pass breakups and one interception through eight games. Jefferson (hamstring) was a limited participant in Friday's practice and is listed as questionable for Sunday's game versus the Steelers. Analysis: Jefferson sat out practices Wednesday and Thursday before returning Friday as a limited participant. Anthony Levine would likely be first in line to fill in at safety if Jefferson can't go this weekend. 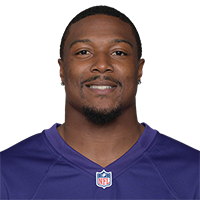 Jefferson has registered 49 tackles (34 solo), one sack and three pass breakups through the Ravens' first eight contests. Jefferson recorded three tackles (two solo) and a sack across 44 defensive snaps in Sunday's win over the Titans. Analysis: The Ravens defense tore apart the Titans' offensive line Sunday, recording 11 sacks on the day. Jefferson's sack came midway through the third quarter, bringing his season total to three. He'll now shift his focus to the Saints, which have only allowed eight sacks on the season. Jefferson recorded nine tackles (eight solo) across 78 defensive snaps in Sunday's loss to the Browns. Analysis: Jefferson led the Ravens in tackles once again on Sunday, pushing his season total to 33. He also played in 98 percent of the team's defensive snaps, which was the third-highest mark on the team during the contest. Jefferson has nine tackles (six solo) and a pass defensed in Thursday's 34-23 loss to the Bengals. Analysis: Jefferson played every defensive snap and has three pass breakups this season, already exceeding his 2017 total. The 26-year-old will look to continue his solid output against the Broncos in Week 3. Jefferson recorded two tackles and an interception in a crushing 47-3 win over Buffalo on Sunday. Analysis: Jefferson and the rest of the Ravens defense had a field day against the Bills offense. The single interception and two passes defensed equal Jefferson's season total last year. His four tackles were respectable as well, and he'll look to extend his strong performance into next week's tilt against the Bengals. Jefferson (hamstring) made four tackles (three solo) in Saturday's 27-10 preseason win over the Dolphins. Analysis: After a hamstring injury held Jefferson out of the team's first three preseason outings, he made his debut Saturday. Jefferson will be the Ravens' starting strong safety again in 2018 after he made 79 tackles, 2.5 sacks and two pass breakups last year. 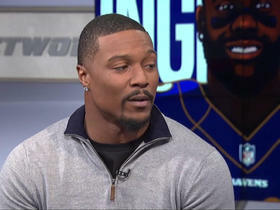 Jefferson has missed six of the last seven practices with a pulled hamstring, Edward Lee of The Baltimore Sun reports. Analysis: Although Jefferson deemed his injury as "nothing serious," he conceded that it needs to fully heal before he can get back to practice. The sixth-year pro is set up to be the Ravens' starting strong safety for the second straight year. He produced 79 tackles (56 solo), 2.5 sacks, two pass breakups and one interception in that role last season. 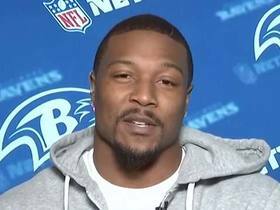 Jefferson restructured his contract with the Ravens, converting $5 million of his base salary into a signing bonus, Field Yates of ESPN reports. Analysis: Signed to a four-year, $34 million contract last offseason, Jefferson had 79 tackles, 2.5 sacks, a forced fumble and an interception as a 16-game starter his first year in Baltimore. He's locked in as the starter at strong safety, with the contract restructure merely serving to free up 2018 cap space for the Ravens. Jefferson is young for a player with five seasons of experience, having celebrated his 26th birthday in January. Jefferson had 79 total tackles to go with 2.5 sacks and an interception in his first season as a Raven in 2017. Jefferson accrued a season-high 11 tackles (eight solo) and a half sack Sunday against the Steelers. Analysis: A large factor in Jefferson's best outing since Week 1 is that he played 88 of 89 defensive snaps. Otherwise, he's been averaging just 4.5 tackles per game, leaving him on the low end of fantasy safeties. Jefferson had three tackles, one pass breakup and one interception Monday against the Texans. Analysis: Jefferson nursed an ankle injury before Monday's game, but he still played all 69 snaps. The fifth-year pro has 50 tackles through 11 games, making him a low-level fantasy safety. 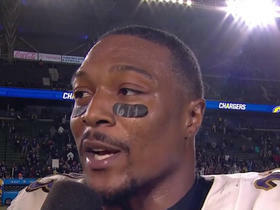 Ravens safety Tony Jefferson discusses his team's win against the Los Angeles Chargers in Week 16. 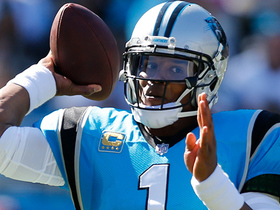 Carolina Panthers quarterback Cam Newton finds wide receiver Devin Funchess for an 18-yard gain. 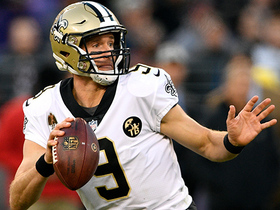 New Orleans Saints quarterback Drew Brees lofts a pass to his tight end Dan Arnold for 25 yards. 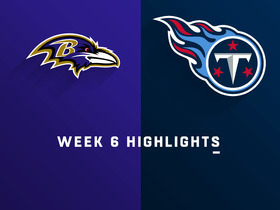 Watch the Baltimore Ravens set a franchise record in sacks in their Week 6 win against the Tennessee Titans. 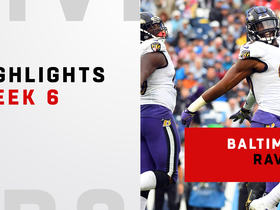 Watch the Baltimore Ravens take on the Tennessee Titans in Week 6.